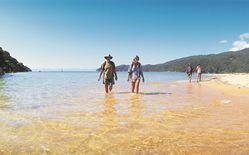 Abel Tasman National Park is known as the "Park for all Seasons", basking under the most sunshine hours in the country, year-round. Spring, Summer, Autumn (Fall) or Winter show their different moods against a backdrop of golden-sand beaches, evergreen native forest, sculpted granite headlands and islands, lapped by crystal-clear azure waters. 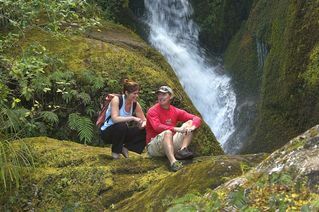 Experience New Zealand hiking even in the winter. Stay at beachfront lodges within the National Park. Have time on your own or share fascinating insights into the cultural and natural history, of this fascinating region. After a day as adventurous or relaxing as you choose, come home to a hot shower and a fine meal, take a moonlit stroll then be lulled to sleep by waves lapping golden sand. Awake to birdsong and breakfast, overlooking the gardens by the sea. 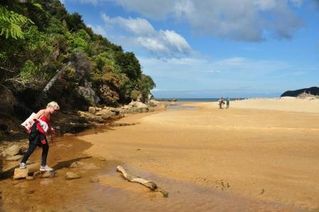 The Abel Tasman Coast Track is well formed, and easy to follow with no point higher than 150 metres (approx. 500 feet). It is maintained to a high standard by the Department of Conservation. The track is mostly shaded by lush native forest, and opens out to sheltered golden-sand beaches and wide, sandy estuaries where you will be exposed to the sun for short periods. Walking each day is optional. This flexibility is perfect for couples or groups that want to visit the park, some preferring to walk, others to take the boat between lodges. • Share authentic Kiwi hospitality. • No heavy pack to carry. Overnight luggage transferred by boat. Meet your guide at Motueka office for a tour briefing, with time for last-minute luggage organisation before departing to Kaiteriteri by coach. Cruise departs Kaiteriteri for a fast, safe, comfortable cruise along the National Park coastline. 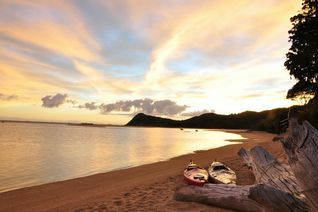 When you arrive at Totaranui, you can relax on the beach or take a walk through the picturesque rainforest of Te Pukatea Loop. Walk south approximately 2 hours (5.5 km + tidal crossing) from Totaranui to Meadowbank Homestead - Awaroa, a home on the finest site in Awaroa Bay. Approx. times for walks, up to 4 hours. Optional kayaking up to 2 hours (tides permitting). Let your guide design your day to as active or relaxed as you wish. Relax and enjoy the comforts of Meadowbank Homestead - Awaroa. Relax on the golden sand beach flanked by impressive granite headlands. Visit Tonga Quarry historic site. Stop for lunch at Bark Bay, and take time out to relax, explore, swim or sunbathe on the golden sand. 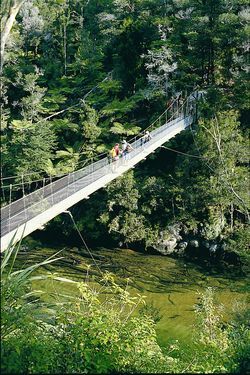 In the afternoon, enjoy a succession of magnificent views of headlands, estuaries and beaches, walking through native forest and crossing the swing bridge at Falls River. Continue on to Torrent Bay Lodge on the beachfront. Optional walking (up to 5 hours, 10 kms) and canoeing (tide dependant). A day of choices! Let your guide plan an adventurous or relaxing day to suit you. Walk to the protected golden beaches of Anchorage and Te Pukatea and visit historic Maori sites at Pitt Head. Bus Marahau to Nelson - 1.5 hours. Walk the well graded final section of Abel Tasman coast track with panormic views across Tasman Bay towards Nelson and the Richmond mountain range. Rediscover the pristine bays and beaches named by French Explorer, Du'mont Durville in 1827. Stop for lunch at any one of the bays, overlooking the islands in the Asrolabe Roadstead, then walk the last leg to Marahau. Our coach meets you to return to Nelson. Keep in mind that walking each day is optional. This flexibility is perfect for couples or groups that want to visit the park, some preferring to walk, others to take the boat between lodges. 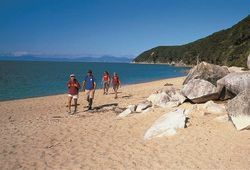 When hiking on the Abel Tasman Track, clients will be staying in ecolodges powered by the sun, and supplemented with pellets made from sawdust, which was once a waste-product of the timber industry, The lodges have modern comforts, and bio-active, self-contained sewerage and waste water systems.